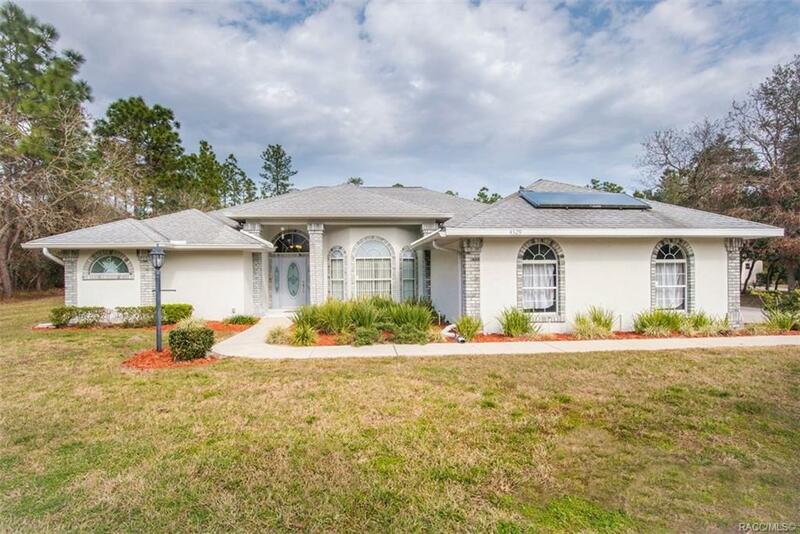 Gorgeous 1 Acre Pool Home with FREE ELECTRICITY?? NO WAY! Yes-WAY! This, the most hip & groovy home Pine Ridge is SOLAR-POWERED, with electric bills as low as $16 mo! ! But WAIT â thereâs more! Enter into a stunning Great Room & you'll gaze thru Wall-to-Wall sliders out to an Expansive Screened Lanai w/ Summer Kitchen, Solar-heated pool, & Wooded Rear Yard. Open-Floor Plan. Huge kitchen is a Cookâs dream w/ Granite Counters. New Acacia Wood Floors throughout! Expanded Garage for all your boy-toys! Large Master & Guest Bedrooms ALL have Walk-In Closets. 7 min. to Shopping, Golf, Medical, 12 min. to Crystal River & 30 min to Ocala! Checks all the boxes! Directions: Turn Onto Pine Ridge Blvd. From *lecanto Hwy (*cr 491, Approx 3.5 Miles In From Hwy) Or *norvell Bryant Hwy (*cr 486; Approx. 5 Miles In From Hwy). Look For Sign And Fire Hydrant.